Smart-home devices sometimes require complicated installation that just doesn’t make sense for renters. Plus, apartments have different needs than single-family homes. That’s why we decided to outfit a whole condo with smart devices that don’t require rewiring or permanent installation. Each week, we’ll tackle a different category and look at various products, then explain how we made our selections. At the end of the series, we’ll examine the smart apartment as an ecosystem, and how all these devices — or do not — work together. For the sixth installment in our Digital Trends Smart Apartment series, we’re on candid cameras. I don’t like having security cameras in my home. I find it creepy. But I do like spying on my cat when I’m out of town, and appreciate the extra bit of security that cameras provide. They’re also an easy way to start wading into the smart-home universe. 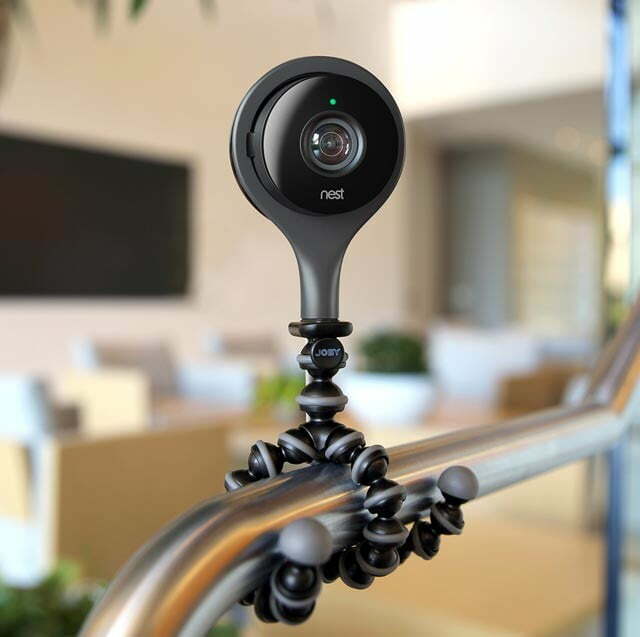 Smart cams are often stand-alone devices that offer some peace of mind and can work in a variety of ways — as a petcam or baby monitor, for example. 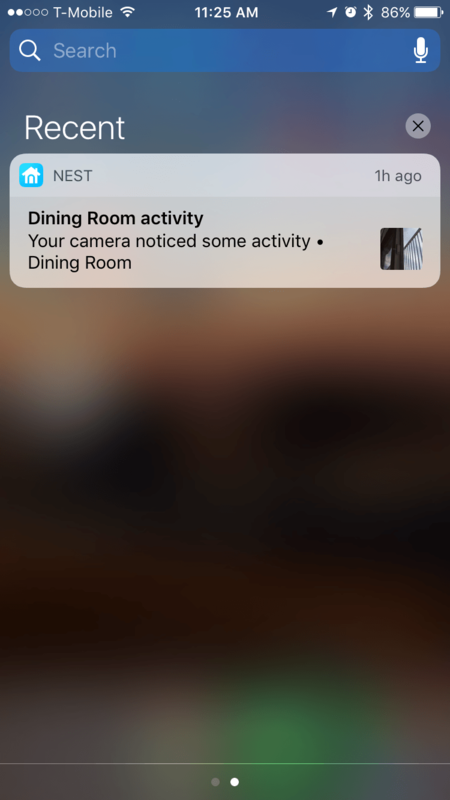 There are a few considerations that went into why I selected the Nest Cam ($299) for my smart apartment that I’ll go over below. In a previous article, I went over smart sensors. With Go Control’s window and door sensors already installed, I wasn’t looking for a bigger security kit. SimpliSafe and iSmartAlarm both have kits that either include cameras or let you add one. That’s a decent option if you’re starting from scratch and want sensors, but we’re going to focus on standalone cameras for the purpose of this article. The Nest Cam is unobtrusive and easy to install, and is perfect for keeping tabs on my cat. One thing to keep in mind is finding a camera that will work with sensors if you decide to expand later. Hubs like Wink (our favorite hub) and SmartThings can tie some sensors together with other products, like locks. You can see a list of sensors compatible with each hub here. We like the Nest Cam, which works with the Wink hub. From the Wink app, you can check out live camera footage and view motion detection clips. You can also turn the camera on or off. That is a slight annoyance (as I don’t like to have the thing on when I’m home), but Nest does have fairly easy-to-use scheduling system. I use it in conjunction with the geofencing feature. When I leave the house, my phone’s location lets the camera know it should switch on. When I come back, the camera turns off. 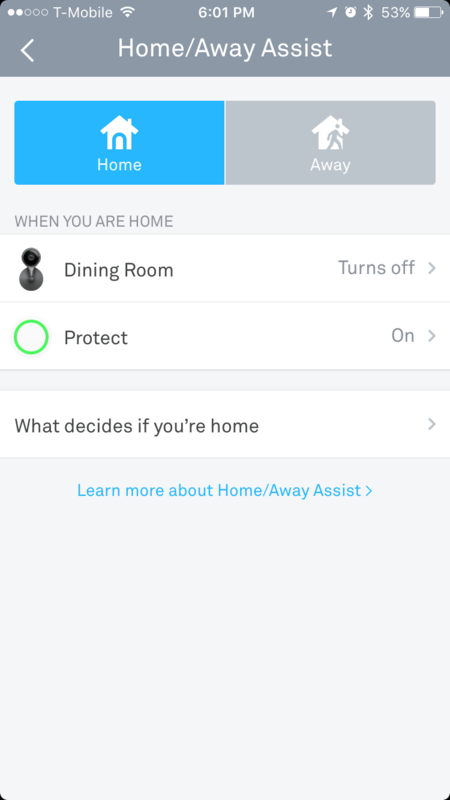 Nest now has a crucial family-account feature that enables its devices talk to 10 phones instead of just one. That means the geofencing can be attached to my phone and my husband’s, so the camera won’t turn on when just one of us is home. Alexa and Google Home both have a place in the smart apartment, but there’s not a lot of use for voice control when it comes to security cameras. If you had a routine, you could tell Alexa to switch on the Nest Cam at your bedtime, but that’s about it. If you have an Alexa or Google device with a screen, say the Echo Show or Lenovo Smart Display, you can view Nest camera footage on it directly, which is nifty. After testing a few security cameras, I’ve noticed I tend to forget their existence. Since they can make you feel like someone’s always watching you — and sometimes they are, without your knowledge — there are a few things to take into consideration when selecting a camera. First, I wanted security of the camera itself to be a priority. 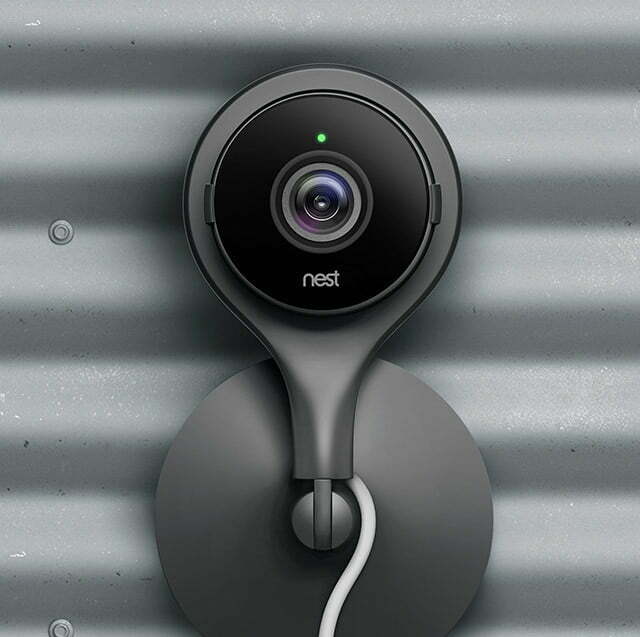 The Nest Cam’s specs — 1080p HD streaming, a 130-degree field of view, and motion and sound alerts — can be found on many cameras. It is missing a few features, though, like the ability to pan and tilt that both the Piper and Canary cameras have. Both of those also have sirens, which the Nest lacks. But the camera is small, inconspicuous, and easy to mount and situate at different angles. One thing I really wish the Nest Cam had is a privacy shutter. The MyFox security camera has one, and it really adds an extra sense of privacy. When I was deciding where to put the camera, I tried to find a place that would both capture any untoward events while still make me feel like I’m not living in 1984. After all, this was mostly a cat camera for when I went out of town over the holidays. Plus, if you have it pointing toward the street, every car that goes by is going to make the camera send you an alert – making alerts pretty useless. You’ll quickly learn where you place your camera is pretty important. Speaking of privacy, when you hear about a smart home getting “hacked,” it’s almost always via a security camera. These cameras aren’t actually being hacked, but users have simply forgotten to – or not realized they need to – change the device’s default password. A search engine that indexes internet-connected devices may also include the default password, meaning even a script kiddy can start watching your feed. Changing the password will definitely prevent this type of spying, but you may feel safer if you keep your device disconnected all together. My main complaint with the Nest Cam is its lack of cloud storage. As you can see from the chart above, many companies give a wide range when it comes to how long they’ll keep your videos around before they start charging you. For $10 a month, Nest will save your videos for 10 days. Netgear gives you seven days for free. Even if it were just 24 hours, that would be enough for most people to see any noteworthy events, but three hours? Hopefully nothing happens when you’re in an all-day company meeting. The main reason cloud storage is nice is that if a thief takes your camera, the footage doesn’t go with it. If you’re shelling out extra bucks for Nest Aware, the service that gives you more cloud storage, you also get Person Alerts. 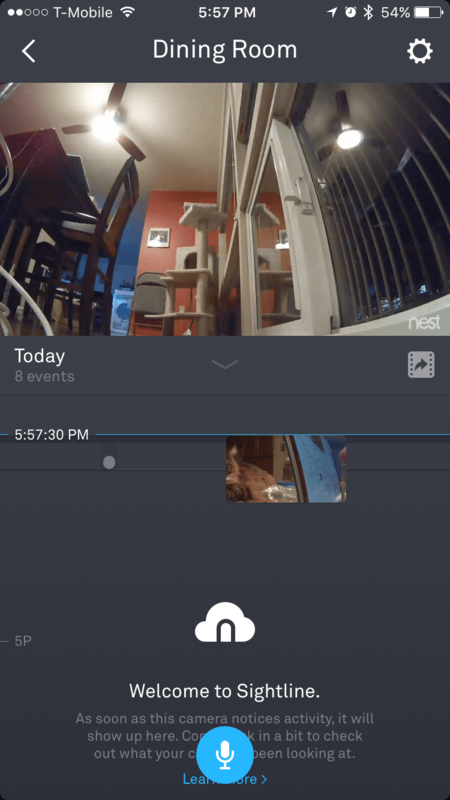 You’ll get a special notification if the camera spots someone — annoying if you’re home with the camera on, nice if you’re gone and someone breaks in. I found a got a lot of alerts when I was on vacation and my cat was prowling around in front of where I set up the camera. This led to a lot of emails that I essentially stopped checking — one danger of the three-hour window for cloud storage. It helped that I had a cat sitter who could hopefully let me know if something major went down, but I wouldn’t want be whipping out my phone every few hours to see a cloud moving in front of the sun during a weekend away. I used the camera’s two-way audio to try and call my cat to the field of view, but he was not having it. For now, the Nest Cam has a place in my smart apartment … and I repeat, for now. Despite its shortcomings, it does make traveling a little less anxiety inducing. I do wish there was a longer cloud storage window for free, but I also like that it’s pretty easy to delete your video history (in case the camera caught you doing anything awkward). However, the last thing devices should be doing is putting you on edge in your own home, so make sure you have it aimed somewhere that will capture bad guys — not your bad dance moves.